Prices start at $59. Minimum age 10; must weigh between 70 – 250 lbs. Closed-toe shoes required. 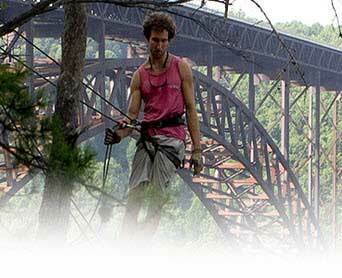 Experience West Virginia’s newest zipline, The Ridges, located on site at River Expeditions. Thrill-seeker meets nature-lover for this exciting 1 to 2 hour treetop adventure. Professional guides lead you up a cargo net climb and along four ziplines and adventure skybridge, offering a rare perspective of the rugged West Virginia forest and wildlife. Bonus rappel experience at the end of the tour, courtesy of an auto-belaying device. This amazing tour takes you high into the forest canopy where you move from tree to tree via a secured harness and cables, led by professional guides. Traverse a network of platforms and sky bridges while quietly observing native wildlife and natural flora in this unique environment. Fast moving ziplines take you soaring through the tree tops for a thrilling ride over rugged terrain. The experienced and friendly guides will give you a safety and equipment orientation before you are outfitted with your personal gear for the canopy tour. Minimum age 10; must weigh between 70 – 250 lbs. Closed-toe shoes required.